(Nanowerk News) A team of Harvard chemists led by X. Sunney Xie has developed a new microscopic technique for seeing, in color, molecules with undetectable fluorescence. The room-temperature technique allows researchers to identify previously unseen molecules in living organisms and offers broad applications in biomedical imaging and research. The scientists' results are published in the Oct. 22 issue of Nature. Partial funding for the project was provided by the National Science Foundation (NSF). Fluorescence is a phenomenon in which an electron in a molecule absorbs energy from light and moves to a higher energy level or excited state. The energy of the light is contained in a unit called a photon. After a very brief stay at the excited state, the electron returns to its previous energy level, or ground state, by emitting a new photon. The energy of the released photon is discharged in wavelengths of detectable visible light lasting only a few billionths of a second. Many biologically important colored molecules such as hemoglobin--an oxygen-transport protein in red blood cells--absorb light but do not fluoresce. Instead, the electrons in these molecules release their additional but transient energy by converting it to heat. "Since these molecules do not fluoresce, they have literally been overlooked by modern optical microscopes," Xie said. To detect non-fluorescent molecules in biological systems, Xie and his team developed a new type of microscopy based on stimulated emission. Stimulated emission was first described by Albert Einstein in 1917, and was the basis for today's lasers. In a nutshell, it is a process by which an excited-state electron, perturbed by a photon having the correct energy, drops to its ground state producing an additional photon. Xie's new microscopic technique generates and records a stimulated emission signal by using two carefully timed input and output pulse trains. In the input pulse train, a modulator switches the intensity of the excitation beam on and off at five megahertz, or MHz. The modulation creates a stimulated emission signal at the same frequency. Each train has an incredibly short pulse duration of approximately 200 femtoseconds. A femtosecond is equal to one billionth of one millionth of a second or 10-15 seconds. The signal produced by the non-fluorescent molecules provides a highly sensitive image of previously "invisible" molecules. One of the several possible applications of the scientists' invention is mapping in color the delivery of non-fluorescent drugs to their target cells. Another possible use is imaging tiny structures such as blood vessels including individual red blood cells and single capillaries. The structure and hemoglobin-dynamics of blood vessels play a major role in many biomedical processes. Two example processes are the transition of tumors from a dormant to malignant state and oxygen delivery in the brain. Current established imaging technologies like MRIs and CT scans either lack the spatial resolution needed to resolve individual capillaries or require external contrast agents. Fluorescent labels such as the green fluorescent protein, or GFP, are extensively used for observing the activity of biomolecules and distinguishing target molecules in a cell. The GFP labeling technique provides well-defined images. However, the bulky protein can disturb delicate biological pathways, especially when it is larger than the biomolecules it is illuminating. 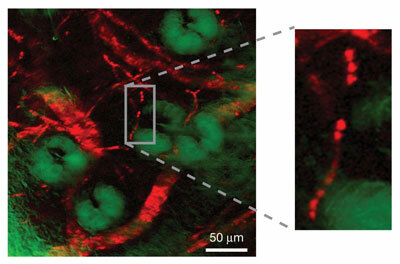 Xie's team mapped the delivery of a non-fluorescent drug molecule and imaged blood vessels without fluorescent labels. Their new technique is also capable of imaging non-fluorescent proteins in cells of live Escherichia coli bacteria. "While earlier studies made use of similar pump-probe experiments to provide images of fluorescent molecules with spatial resolution comparable to that of confocal fluorescence microscopy and high temporal resolution, this study, for the first time, makes use of stimulated emission microscopy to image non-fluorescent molecules," said Zeev Rosenzweig, a program director in the NSF Division of Chemistry. Although potential photo-damage, and the complexity and cost of the system still need to be addressed for the technique to gain wide applicability, "there is no doubt that the study provides a unique way to image a wide range of molecules currently inaccessible to today's state-of-the-art optical microscopes," notes Rosenzweig. "This is just the beginning," added Xie. "Many interesting applications of this new imaging modality are forth coming." Additional authors of the Nature paper include Wei Min, Sijia Lu, Shasha Chong, Rahul Roy and Gary R. Holtom. Min and Roy are postdoctoral fellows; Lu and Chong are graduate students; and Holtom is a research scientist. All authors are members of Xie's research group. Funding for the research was provided by the NSF Division of Chemistry, award number CHE-0634788, and the U.S. Department of Energy's Basic Energy Sciences Program, award number DE-FG02-07ER15875.